Jude Isabella wrote Salmon: A Scientific Memoir, due out in October. In the backyard of a house in an affluent North Vancouver neighbourhood, the sun glints off a red lawn mower, abandoned midway through the job, close to an unused trampoline. Rob Higgins stoops to comb a pencil through the shorter grass. What lies beneath the ground is tiny, but a massive headache for the humans in the habitat. Earlier in the day, the homeowner abandoned his mowing after six stings. Two years ago, when he and his family moved in, he discovered the insects and called city officials, who in turn called Agriculture and Agri-Food Canada, who called the ant specialist. (The homeowner asked not to be identified, because his neighbours are angry with him for going public about the community’s ant problem.) While Higgins examines the nest, the man strolls into his backyard. “Have you ever been bitten? ” he asks. The scientist has, and a half-hour later, when he’s in a neighbouring yard waving the pencil again, he jerks his hand back—too late. A red welt erupts where an ant has stung him. European fire ants are not native to Canada; they’re not even strictly European. They’re Eurasian, ranging from Ireland to Siberia. In their home environment, they live in an unforgiving world of competing ant species, deadly pathogens, and predators that control their populations. Not so in North America. 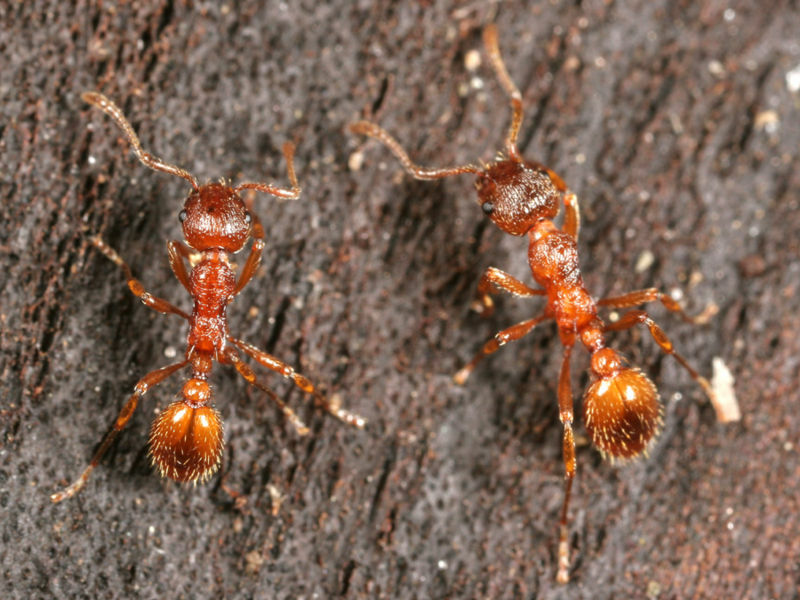 Myrmica rubra muscles out native ants, competing for food sources, intimidating them, and, occasionally, dismembering and eating them in full-on ant wars. Territory claimed, the invaders colonize, building 1.5 nests per square metre. Each nest contains up to sixty-eight queens and 15,000 workers. The insects have a sweet tooth and like to feed on honeydew, otherwise known as aphid excrement. Aphids—themselves a garden nuisance—can, in ideal conditions, double in population every three or four days; fire ants carefully tend and “farm” them, to ensure an abundant food supply. European fire ants emigrated to Massachusetts more than a century ago, probably hitching a ride on imported plant material. The first province to report their presence was Quebec, in 1915, and since then they have spread to Ontario, Nova Scotia, New Brunswick, Prince Edward Island, and Newfoundland. In BC, they are thought to have arrived about two decades ago but were not officially identified until 2010. Though infestation is widespread in southwestern BC, reporting has been spotty, making the problem more difficult to address and contain. In June, the Invasive Species Council of BC hosted a meeting in Burnaby with provincial officials, the Canadian Food Inspection Agency, and representatives from affected municipalities and districts, to work on a plan for containing the ants. At the federal level, however, the government does not consider them an invasive species, and there are no efforts to control their spread. “Individual homeowners can’t deal with this ant successfully. It’s the wrong scale entirely,” Higgins says.